It’s not often you come across two games released in quick succession that sound as similar as Final Fantasy XII and Rogue Galaxy. FFXII has Sky Pirates; RG has Space Pirates. Both start off in a desert town. FFXII takes several plot points from Star Wars, RG takes several characters from Star Wars. The main characters even sound rather similar for a while. But I digress. They are actually very different games, and although comparison would be fun, it wouldn’t do as an unbiased review. 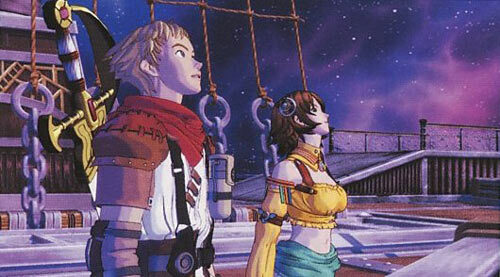 In Rogue Galaxy, you follow the story of Jaster, a young native of the desert planet Rosa who wants to explore space. Through a few coincidences, he is mistaken for a famous mercenary and hired to work for a group of space pirates, led by the notorious Dorgengoa. Soon enough, you find out about an ancient treasure-filled planet and Dorgengoa assigns to you the task of finding the way there. The “space pirate” part is where the story unfortunately breaks down somewhat. It’s really cool that the spaceship you travel in looks just like a pirate ship, but there is very little pillaging or plundering. None of the eight-character group of potential party members, except possibly Zegram, has the personality of a pirate. They’re all incredibly good-natured, and in fact very little of the game involves doing piratey deeds. Should have payed for the valet service. Fortunately, pretending to be a space pirate while not really being one is still fun. The battle system is very solid and intuitive, and has enough variation that it’s fun. There aren’t fighting-game style combos or special moves, but each character has two weapons and a variety of magic-esque techniques. Your battle party has three characters, and the friendly AI is actually pretty good most of the time. Although there are elemental affinities associated with weapons, monsters, and abilities, these can be safely ignored for those who would rather just play the game than strategize. The animations associated with techniques can also be skipped, which gives combat a fast-paced fluidity that is entirely too rare. The only problem with pacing is that you have to use items (which are the only way to heal) pretty often, which breaks up the flow of combat. Sometimes, enemies do several area-of-effect skills, and if your entire party is in that area they can all die near-instantly, which is the only way I actually ever saw the Game Over screen. Fluidity may well be this game’s main appeal. There are load times associated with loading the game, teleporting (via a very convenient system, all save points on a planet are linked), and loading of only the longest cut scenes. If you stay on the same planet for a gameplay session, it’s conceivable that you wouldn’t see a single loading screen for hours at a time. If you go into a new area, it’s already loaded. If a battle starts, from “Warning!” to fighting is less than a second. If a battle finishes, from “Congratulations!” to returning to dungeon exploring is even less, since you can move during the battle results screen. This is how loading (or the lack thereof) should be done! I mentioned that most of the characters are not like pirates at all. They may not say “Arr” very often, or tell anyone to walk the plank, but most of the eight are still largely enjoyable. There is only one character I really dislike, and he is coincidentally the one character you only have to use in one battle. Although character development is lacking for a couple of them, and is uneven throughout the game, it was well done. The characters begin rather cliched (Zegram, for example, needs no introduction; he has an eye patch, long coat, over-sized sword, and cynical attitude), but are developed more as the game progresses. 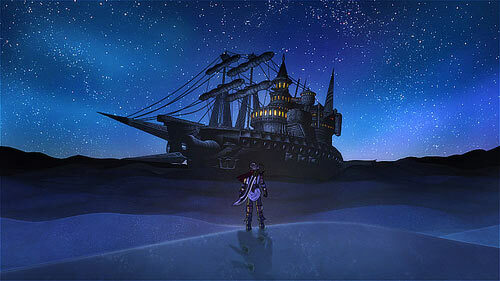 Where Rogue Galaxy really manages to create a great first impression is in the graphics department. Although I wasn’t incredibly impressed by Rosa, several areas on other planets gave me an initial sense of awe at what I was seeing, and as I explored the areas I would tilt the camera to watch the landscapes. It’s still not realistic, but it looks amazing, particularly for the PS2. In addition to the nice backgrounds, characters have great design, and as you progress in the game you can find new outfits for each character. Outfits are equipped in place of armor, but most don’t have any significant bonuses. Mechanics outside of battle aren’t too complex, but still favor those who enjoy exploration and puzzles. To get new abilities, you activate sections of the Revelation Flow (think License Board or Sphere Grid) by placing items in them. You get items in treasure chests (scattered all over, but not randomized) or from fighting enemies. Each ability you unlock can give you access to other abilities, so fighting enemies is to your advantage if you want to unlock more abilities. Weapon combination, which you can begin to use early on in the game, is very intuitive. You can combine two of any type of weapon to get a third, and you get a chance to cancel the combination if it wouldn’t give you anything good or would give you a weapon you can’t currently equip. Almost every weapon you receive can be improved in some way, including ones that you receive in plot events. Combining weapons is also the only way to get the strongest weapons in the game. Even outside of weapon combination, Rogue Galaxy is a completionist’s dream. 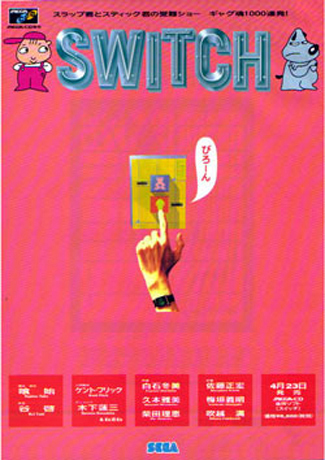 There are Hunts (like in FFXII), Hunt records (where you defeat a set amount of a type of enemy for points), the Hunter Ranking (based on points from the previous two), the Revelation Flow, weapon combinations, the Insectron (a Pokemon-ish minigame) and the Factory system (a set of simple puzzles in which you combine items to make a new type). There’s also a (smaller) planet that is completely optional. Any of these minigames / completion sets can be done until you initiate the final boss fight. After you beat the game, you can load your “completed” save and go through two extra areas, the second of which is a randomly-generated 100 floor dungeon. In the end, however, all of these are entirely optional and not necessary to finish the core game, which is quite enjoyable on its own. Outside of character development being uneven, and the plot containing very little in the way of treasure maps and daring raids on convoys, the only other major complaint about the game I have is its area design. I love how different the various planets are, but the maps on each planet become repetitive quickly. Some of the longer dungeons, in particular, can become boring to explore, but the enjoyable combat system generally makes up for this issue. Despite its plot and dungeon design flaws, Rogue Galaxy manages to give me that indescribable “fun factor” that’s a combination of so many features, and I’m beginning to think Level 5 may be the next great RPG company. For a nearly 60-hour game (barely touching the Insectron and Factory), keeping that sense of fun is no simple feat. 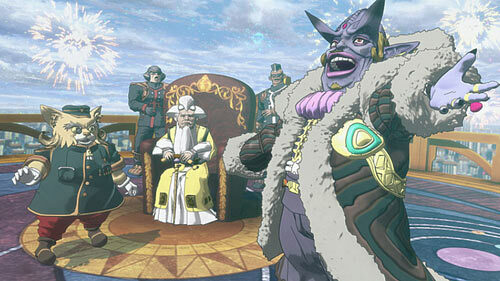 Rogue Galaxy is a game I thought would change the jRPG landscape. Instead it is a rather typical RPG in many respects, a fusion of the item synthesis and realtime combat of Level 5’s Dark Cloud 2 with the traditional pacing and setup they learned while making Dragon Quest 8. The result is gameplay that works in a strangely addictive way, as the items and hunts and extras give weight and reason for the OCD level grinding common to this and many other games in the genre. I also appreciate that the game tries to make the RPG experience as seamless as possible; it plays the way I expected the entire genre to evolve to on the PS2, though it took to the end of its life to get there. On the other hand, Rogue Galaxy does little to evolve story telling. The characters are straight out of the most meddlesome of anime cliches, and parts just fall flat because you’ve seen the same things too many times in past games. This is somewhat remedied by a fantastic localization, but it only can go so far since the plot is formulaic to begin with. Rogue Galaxy is not the full package that one might expect from a high profile RPG, but that’s because it is caught between being traditionalist while also pushing choice concepts forward. Its an RPG for the non RPG fan, and yet it is not. In the end I have to respect what it is trying to do, and it can be very hard to put down. Level 5 aren’t yet a force to be reckoned with, but at this point I think it is only a matter of time before they blow the lid off this whole genre.